The Spring House is the only built Frank Lloyd Wright designed home in Florida and it is here in Tallahassee. FSU Art students and faculty have conducted classes studying the house and its grounds yielding many works that are inspired by the experience. 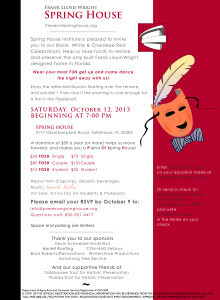 On October 12, 2013, the Spring House Institute will host the Black, White and Cherokee Red Celebration. This celebration includes the exhibition of some of those works.